Here's my Easter Poem on a Plate for today, using only the plates - a found poem!. Can you read it? I've put the poem below the plates. It's R today for AtoZ! R is for ride, too. Our motorcycles arrived yesterday evening in perfect shape. I had my denim skirt on, but I took it for a spin around the block as soon as it hopped out of the van...no helmet, no jacket, no gloves, no valid license plate...what a Rebel! Boy, did that feel fine! Now to get our driver's licenses here and get these registered and inspected here. Sigh. No real riding until that is done. 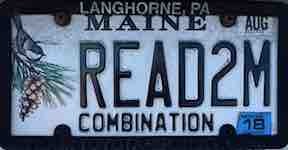 R is for READ2M - I thought first it was Read 2 ME and then I reread it... ah, "read to 'em" - probably a teacher's plate. Find more AtoZ Challenge participants here. First, it is Poetry Friday.. so you have to opportunity to read and relish poetry from all around the world today, just by clicking on a few links at Amy Ludwig VanDerwater, our Poetry Friday host today at The Poem Farm. Secondly, yesterday was Poem in Your Pocket day - though no one seemed to know that. But I gave my grandson poems to be handed out at school anyway - he handed out 30 poems for kids to put in their pockets! I visited our local library and handed out a few myself. I figured, why not? It was a school break day for some area schools, so there were parents and students everywhere. 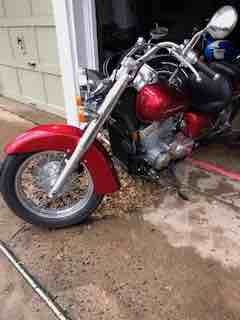 And then a side note...our motorcycles arrive today sometime, along with my helmet, jacket and boots! So exciting. Hope the trip goes smoothly! And now for AtoZ Q day. Honestly, this has been the worst letter every year! People just don't like using Q on their plates. I have used these all in the past on Q day. Q is for...QUANDR3 - I made my own plate and posted all my other years entries...I'm not liking Q. When I get back to Maine, I think I'll have to think of a good Q vanity plate for my car. And rules I’ve had to bend. Is not my cup of tea. And it just makes me sick. And changing them to Q.
I wrote a Quinzaine for this one. A quinzaine is an unrhymed verse of fifteen syllables in three lines with the syllable distribution of 7/5/3. The first line is a statement and the next two lines ask a question relating to the first line. Quatro = a small guitar with four or five strings or pairs of strings, used in Latin American and Caribbean music. So, you say, this doesn't begin with a Q. But, see those two Q's! So this counts. And it is the only one I could find besides GQQD LF which I used a while ago on a Sunday this month. "I think she'll be fine!" "I'll cut down on the pine." Just one more tree, please?" Doc BrownCow was quite clear!" A cool treat of pine cones. So, forgive me for no Q at the beginning? What, you have never heard of Quidditch? You do not know the sport of Wizzes? Plays it and knows what this is. It's not as confusing as it seems. Worth 10 points in the game Quidditch. How 'bout a game of chess, my friend? It is day 18 of National Poetry Month, and today is Poem in Your Pocket Day - the day to carry a poem around in your pocket to read to a friend. I've posted that below my AtoZ. 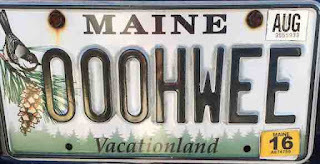 I am writing poems each day this month based on Maine vanity plates I've spied this past year. The AtoZ does not have a letter for Sundays, but I will post a non-vanity plate or extra vanity plate poem on that day. Today is day 16 of the AtoZ, and we are on the letter P.
Pushing through the soil to touch the rain. while dancing on the edges of the lane. The honeybees hum-buzz a sweet refrain. A loveliness of ladies clutter. The petal pushers drive them all insane. Reviving joyous birds in choral strains. The Symphony of Spring none can contain. Don’t disturb those giant jaws! Stay away from giant claws! Watch out for big feet that stomp! A suit of armor’s what you’ll need! I don’t have a lot of time...hmmm…. Maybe one about a dog! And how it likes to roar! And that is how my poem goes! I like my poem a bunch! It is day 17 of National Poetry Month. I am writing poems every day in April. It is also the month of the AtoZ Challenge, and my 8th year in participating. 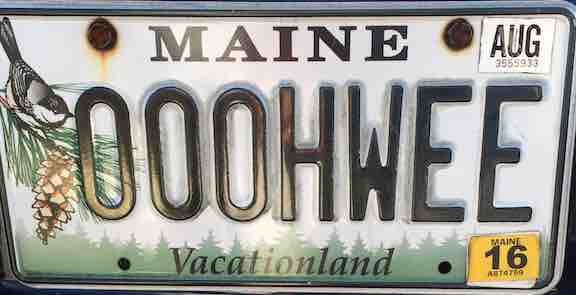 Combining the two, I am writing poems based on Maine vanity plates I've spied this past year. Today is day 15 of the AtoZ, and we are on the letter O. And these were some others. If you saw my 2016 AtoZ, you saw these extras. It is day 16 of National Poetry Month. I am writing poems every day in April. Today is day 14 of the AtoZ, and we are on the letter N.
N is for...both of these! And N is for Nonet. The Nonet is a 9-line poem having 9 syllables in the first line, 8 syllables in the second line, 7 syllables in the third line, and continues to count down to one syllable in the final (ninth) line. With just a little bit of tweaking, I turned this Nonet into an Acrostic-Nonet - which I THINK I just invented...I shall dub it the Acro-Donet! Lol! It is day 15 of National Poetry Month. I am writing poems every day in April. 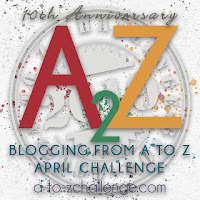 It is also the month of the AtoZ Challenge, and my 8th year participating. The AtoZ does not have a letter for Sundays, but I will post a non-vanity plate or extra vanity plate poem on that day. Yesterday I did REJOICE. Welcome back AtoZers for the letter M - the 13th letter. from lanes and lines are freed. know something of their deeds. he's "R3TIR3D" not "GN 2 S33D"
Click here to visit more AtoZ Challenge participants. A to Z resumes tomorrow with M.
I decided to try a Rondine for the poem today. Maybe I'll try another Rondine on the day for R. It wasn't that easy, but it worked itself out. This is a plate from my collection this year that works for a Sunday. It almost doesn't need a poem. The word is a poem all on it's own. both quenching thirst and flaming coals. Others know my heart’s rejoicing. is not devoid of joy in strife. I began the second one, JOY, first. Got interrupted, and lost my momentum. Began again and gave myself a challenge with the Rondine, and wrote REJOICE. Then I went back to my original poem and picked up from where I left off. So which do you like better, or neither one? Isaiah 65:18 - But be ye glad and rejoice for ever [in that] which I create: for, behold, I create Jerusalem a rejoicing, and her people a joy. It is day 13 of National Poetry Month. I am writing poems every day in April. Live to ride or Love to ride? It is day 12 of National Poetry Month. I am writing poems every day in April. Today is also Poetry Friday, so there are poems gathering - lots and lots of links to follow to great poetry at Irene Latham's place today. Check out the links at Live Your Poem, today. Irene is also hosting the Progressive Poem for April. If you go to Reflections on the Teche later today, you will see Margaret Simon's line she's added. Today is the 12th so we are on line 12...follow along with us! I'll be adding the 30th line on the last day. On this 11th day of the Challenge, we are on the letter K. I couldn't find a K plate before we moved, so I made this one up on the licensemaker site. Sorry!!! But this seemed like a plate you might find in Maine! Right whales got their name because whalers thought they were the "right" ones to hunt, as they float when dead and often swim within sight of the shore. Their habitat is off the coast of New England. It is day 11 of National Poetry Month. Thus, I am writing poems every day in April. On this 10th day of the Challenge, we are on the letter J. "No, thanks", says my back. "I'll pass", say my teeth. It is day 10 of National Poetry Month. Thus, I am writing poems every day in April. On this 9th day of the Challenge, we are on the letter I.
would sit upon my small thumb. our friendship soon would end. they filled a robin's need. sweet insects on their own. Here are more AtoZ participants to visit if you've a mind to! It is my 8th year in participating in the AtoZ Challenge, and it is day 9 of National Poetry Month. 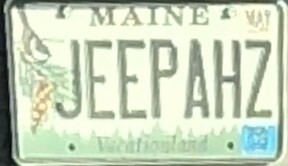 Thus, I am writing poems from A to Z based on Maine vanity plates I've spied this past year. The AtoZ does not have a letter for Sundays, but I will post a non-vanity plate or extra vanity plate poem on that day. On this 8th day of the Challenge, we are on the letter H.